August 1939: Thirteen-year-old Poppy Brown is evacuated to a village in Dorset. Tired and frightened, she arrives with nothing but her gas mask and a change of clothes to her name. 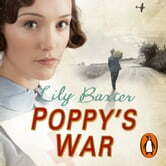 Billeted at a grand country house, Poppy is received with cold indifference above stairs and gets little better treatment from the servants. Lonely and missing the family she left behind in London, Poppy is devastated when she hears that they have been killed in the Blitz.